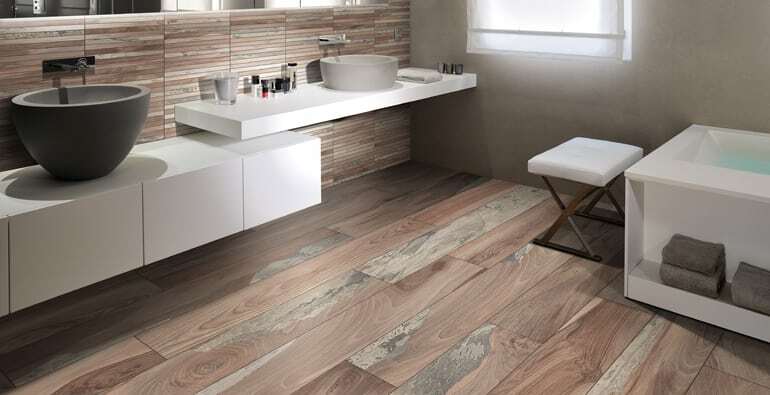 There are many choices when shopping for flooring materials. How can you know which flooring will be best for your home? Take a good look at tile — one of the best choices for your home’s interior. Tile has a long list of benefits over other materials which make it a desirable home feature for homeowners. Here are just a few of the reasons to love tile. Tile is wonderful in any room in your home and stands up well to foot traffic. It is stain- and water-resistant making it perfect for rooms like the bathroom or kitchen which see more than their share of moisture and spills. Tile is also better for the environment since it is fired at high temperatures in kilns with little to no VOCs (volatile organic compounds) present. Mold resistance is another reason tile is a great choice. Tile does not absorb water. Since mold needs moisture to survive, tile is perfect for showers and bathroom floors. A home that isn’t harboring mold is a healthier environment, especially to those with allergies! With all of these great benefits, you can feel good about your family (human or animal) spending time in any tiled room in your home. Tile comes in an array of styles, shapes, sizes, patterns, and colors. Your imagination is the only limit! Mix colors, create original borders or even install tile that mimics the look of wood. Whether you are looking for a neutral palette or a wild pattern to incorporate into your home’s decor, tile can do the job. Don’t forget your grout options either. Grout also comes in a large variety of colors so you don’t have to worry about it detracting from your ideas. Tile is incredibly easy to maintain. Spills and other accidents are a breeze to clean up. Daily sweeping will help keep dust and dirt out of your way while a weekly cleaning with a damp mop will keep your floors looking shiny and new. With this long list of benefits, you may expect that tile would have a short life expectancy. However, that couldn’t be farther from the truth. Tile doesn’t absorb water, is scratch resistant, and can handle large amounts of foot traffic without batting an eye. Dirt washes away easily, mold and mildew can’t survive on it, and stains don’t have a chance. With proper care, your tile can look new for a very long time. Since it doesn’t need to be replaced on the same schedule as other flooring types, your dollar goes further with tile. In fact, it’s long life makes it the least expensive flooring option! There you have it! With so many reasons to love tile, the only tough decision will be choosing the color. Visit one of our showrooms today for a consultation about the best tile for you!